Cooperation | Just Visit Siena ! According to my post from 30th April today is second part of my collaboration with Genevieve Hassall. With pleasure I post today her memories from Italy. ,,Travelling through Italy was the highlight of my most recent trip to Europe, as I was able to experience the big cities, quiet beach side towns and beautiful nature. I saw the stunning towns of the Italian Riviera and the cities steeped in culture further north. 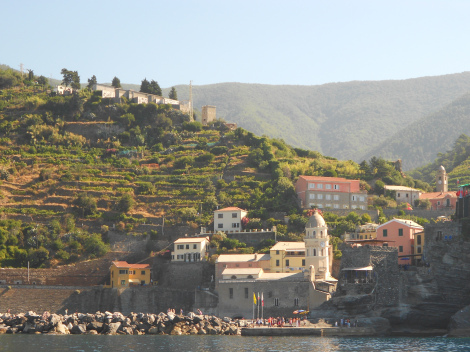 I started in the idyllic seaside town of Levanto and then travelled to each stunning hamlet of Cinque Terre. Coming from Australia, I am used to beautiful beaches but Levanto is now my dream holiday destination for pure relaxation. Our Villa Clelia B&B host was wonderful and very friendly and the local community was very charming. English wasn’t as widely spoken, which I found refreshing. Cinque Terre was more touristy but undeniably gorgeous. I have never seen anywhere like it! 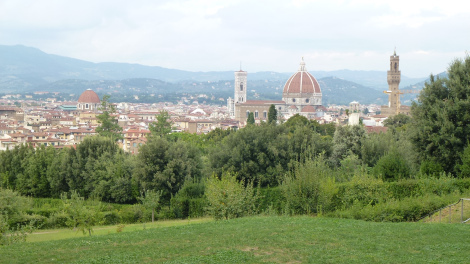 After relaxing on beautiful beaches, we moved north to Florence. 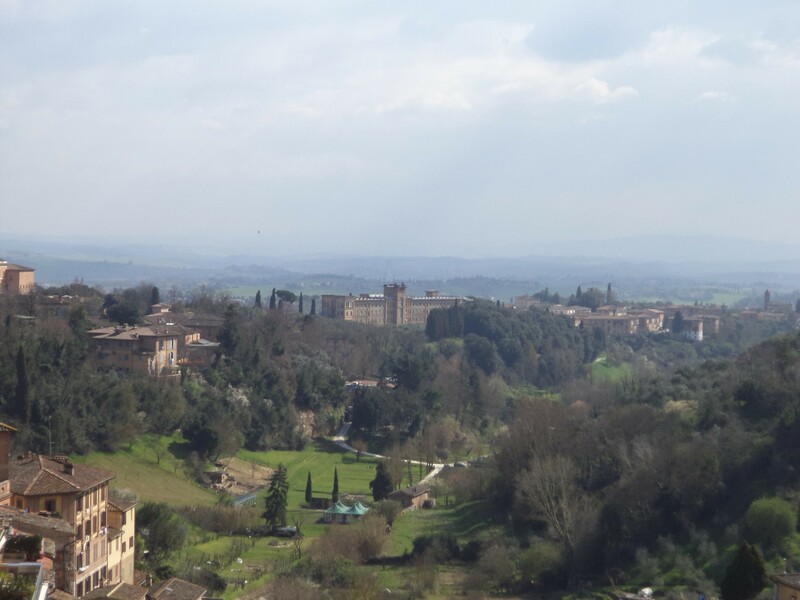 Tuscany has to be my favourite region of Italy, I could have stayed so much longer! My only regret while staying in Florence was not visiting Siena. After a few weeks of travelling quite quickly, we were in need of some down time in Florence. I still dream about the beautiful boutiques in Florence! On my first visit to Florence I bought a beautiful wallet and three years later I still get compliments on it. We only had a two-hour train stopover in Milan, which we used to see the Duomo and the very beautiful shopping mall (if you could call it that!) beside it. We stayed for a few nights in Verona and had another wonderfully accommodating B&B host and then spent a day in Venice. Venice is a must-see destination, but I have to say I preferred it in winter when it was more quiet. In September it was packed with American tourists, which was a little annoying. As a tourist myself, I can’t really complain. Not all Americans are noisy either, but the few that are make up for every other quiet tourists in town. After Venice, we went to Rome. Rome is an impressive, very masculine city which is huge, sprawling and full of contrasts. I can appreciate Rome’s incredible history, but I prefer beautiful Florence which feels more feminine and quietly sophisticated. Finally, we stayed in Sorrento, a gorgeous seaside town. From here we made day trips to Capri, Amalfi and Positano. The most blissful day of my life so far was spent on a boat sailing around Capri. It is hard to worry when you’re soaking up the beautiful sunshine, admiring the blue, green and white grottoes and jumping off the boat into the refreshing, deep blue ocean. I love the mosaic work throughout the south of Italy, particularly in Capri and Amalfi. It is easy to see why the region is known for la dolce vita and why it inspires thousands of travelers every year to visit these glamorous holiday destinations. Although the towns and cities I visited were very different to each other, throughout Italy two things remain constant: The most delicious food and the most warm hospitality. I will admit, I am not the biggest fan of “Italian” cuisine back home in Australia. Big pizzas and pastas full of too many toppings and heavy sauces leave me feeling bloated and overwhelmed. In Italy, the food is perfect. Real Italian food is not as heavy and not as fatty. It is served in much better portions and every ingredient is of such high quality that they do not feel the need to shovel too many flavours into a dish. Small, family-run restaurants were the best. Our Italian B&B hosts were wonderful ambassadors of their country. They were the friendliest, the most helpful and the accommodation rooms and food provided were the best of our entire trip. They were always amicable and happy to share their recommendations, drawing routes and the best local restaurants on our maps. Many even drove us to the train station at the end of our stay, loading our luggage into their small family car and making sure we made our train on time. 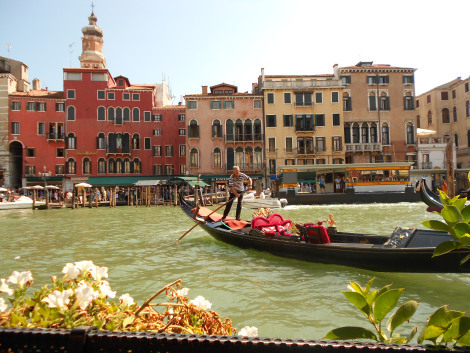 Italy is a destination for couples, friends and families. It brings out your inner foodie and feeds your inner fashionista. It’s hard not to fall in love with history in Rome or art in Florence. I challenge you to hold onto your worries while wandering the streets of Cinque Terre or stress about your diet as you sit down to eat in Levanto. Italy brings out the best in everyone. Genevieve shares her beautiful travel experiences on a budget on her blog, Wanderbug, http://www.thewanderbug.com Genevieve owns the photos in this post, Visit Siena has permission to use them. She has also recently launched Global Gourmand, a new online destination for learning about food culture around the world. Global Gourmand is looking for contributors from around the world to talk about the best food in their country, region or city. This time is something about Siena’s typical food on request Genevieve Hassall (www.thewanderbug.com) that started her second website Global Gourmand (www.theglobalgourmand.com). 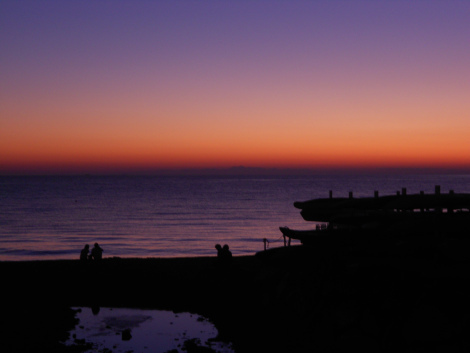 The aim of this website is to help travellers before a trip, to discover the food of the place. In her E-mail she asked me to write a guest post about the food in Siena. For me it is a great idea. I know that all of you know very well Italian pasta, pizza, coffee or gelato. However knowledge about Siena’s delicacies is not so common. What is more it is very useful to have this knowledge when you are here. So let’s start! 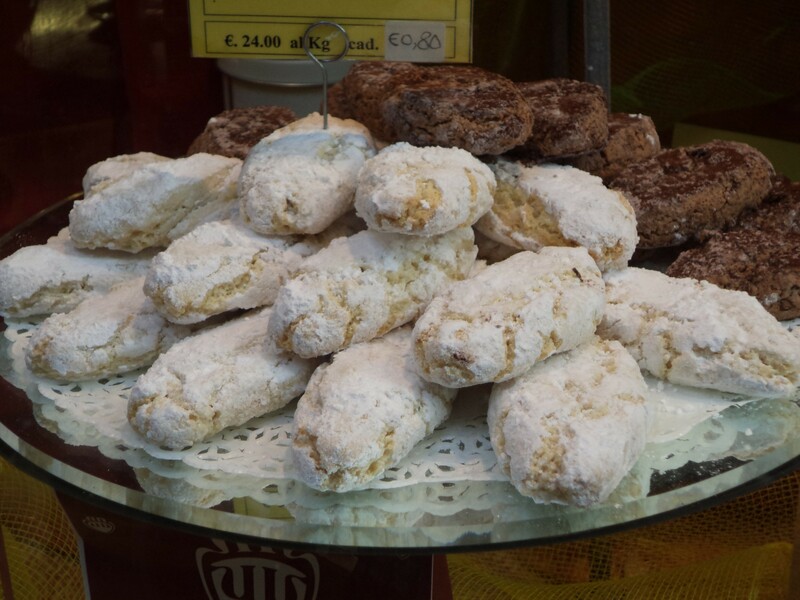 Ricciarelli are biscuits with origin in the Tuscan city of Siena dating to the 14th century. 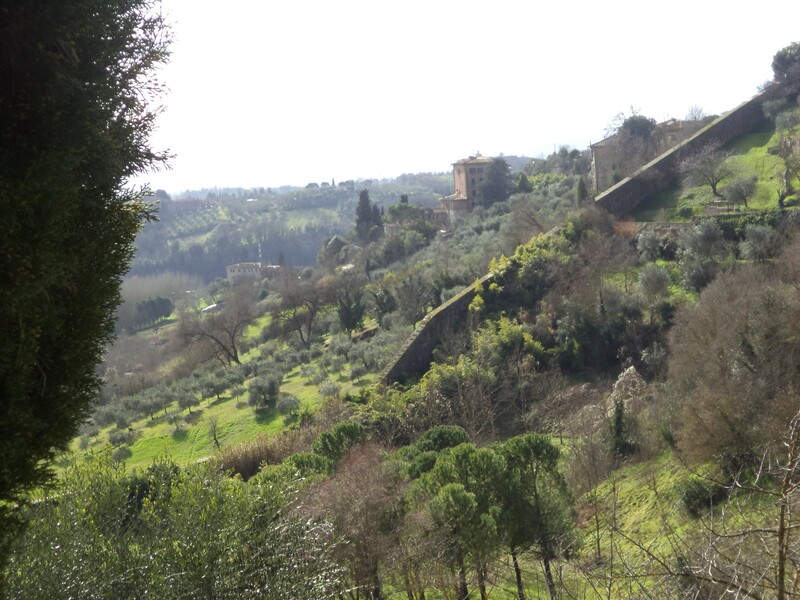 According to legend they were introduced by Ricciardetto della Gherardesca in his castle near Volterra. But let’s come back to the present and our reality! What’s the recipe? And here lucky me! My favorite almond is a main ingredient. Thus the unique biscuits are made using an almond base with sugar, honey and egg white. Traditionally almonds are ground with a milling machine. After this they are formed into mostly oval-shaped cookies, and then are left for 2 days to be baked. Their surface is usually lightly sprinkled with confectioner’s sugar. Yes they are sweet, but I can guarantee you that one biscuit will be not enough for you. Only their price (small box costs about 6EUR) or calories (about 500 kcal per 100 gr) can stop you but maybe it will be not a big deal for you. The best for sure is a soft heart of Ricciarelli that melts in your mouth. Welcome to the seventh heaven! Formally time for Ricciarelli is Christmas . 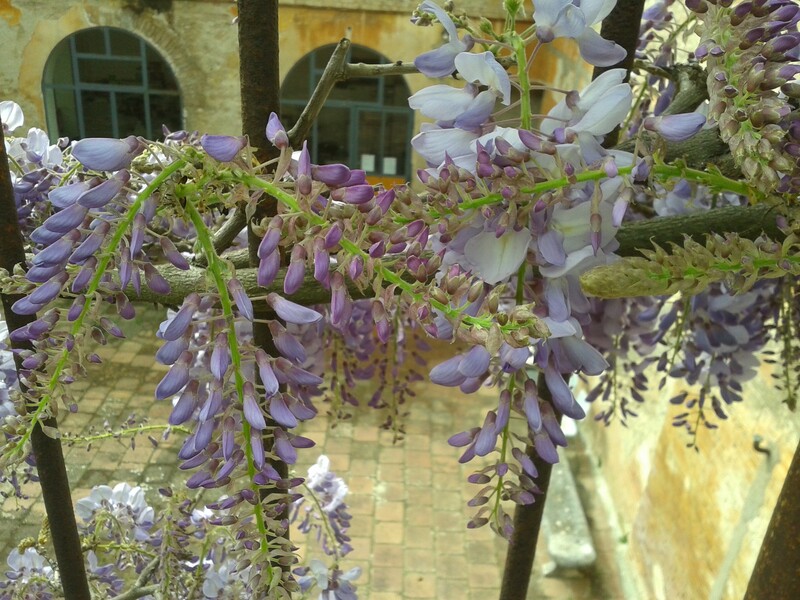 . . but if you are in Siena you will notice that their best time is ALWAYS. Pici – type of hand-made pasta, similar to spaghetti but larger and for me much tastier that originates in the province of Siena. 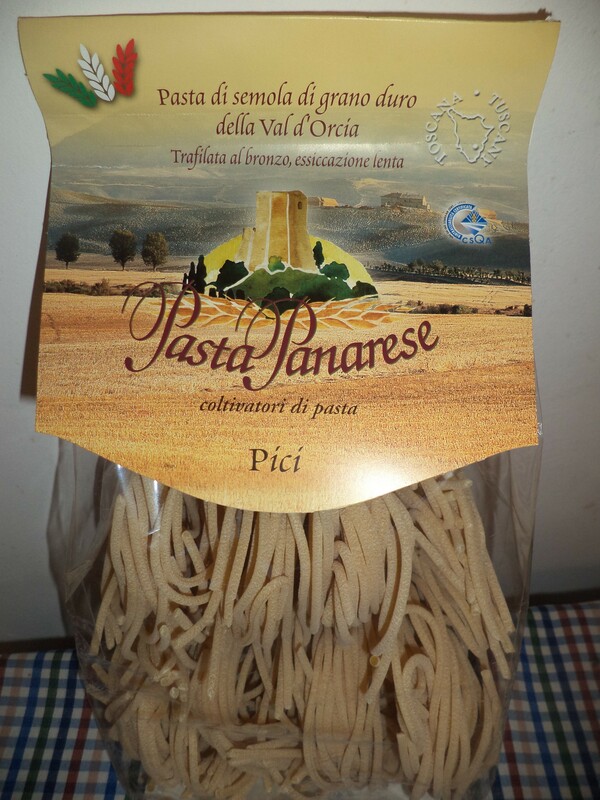 Pici you can buy in Siena everywhere – supermarkets or small shops. It is more expensive then another pasta (even four times) but is unique and I am sure you can’t find it in your place! That’s why you should find it here! Price per 500 grams is about 2-3 EUR. How I convinced recently it is also possible to get truffle Pici. 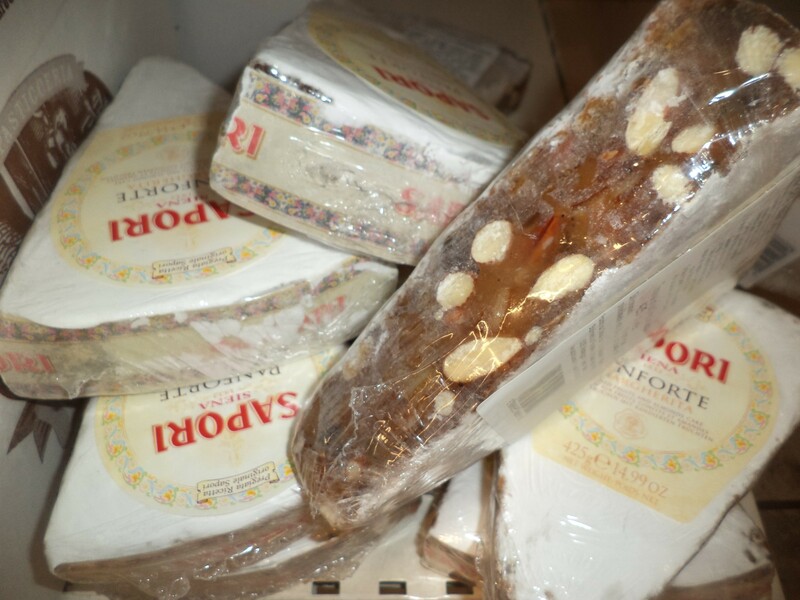 Panforte di Siena – is another our local delicacy, also the most popular in Christmas time but available throughout the year. Thus sugar is melted in honey and various nuts, fruits and spices are mixed together with flour. This everything is then baked in a flat pan. So easy, isn’t it? The taste is for me unique and totally priceless. For sure the most impact have spices and perfect quantity of ingredients. In Siena it is sometimes said that Panforte has to have seventeen different ingredients that reflects the number of Contrade. Here as you will for sure notice our Panforte occurs in a variety of sizes, tastes and wrappings. That is why price is different. Certainly it is not a cheap tidbit! But as you can guess for sure it is worth its price! What is more you shouldn’t even consider how much you have to pay! Then you can enjoy the uncommon taste with for example cup of coffee or glass of wine! Trust me without it you shouldn’t leave Siena. Il Panettone is tradition for Christmas and New Year. 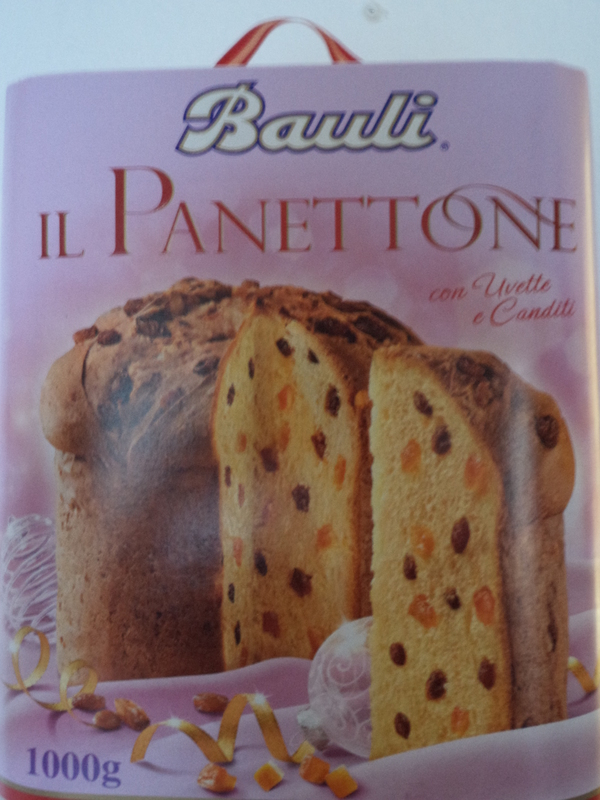 Panettone you can find easily in supermarkets or smaller shops. You should only remember that cake is generally only available seasonally. Then only get your slice of this dainty and enjoy the great taste with a glass of sweet wine (for example Asti or Moscato d’Asti) or sweet hot beverages. 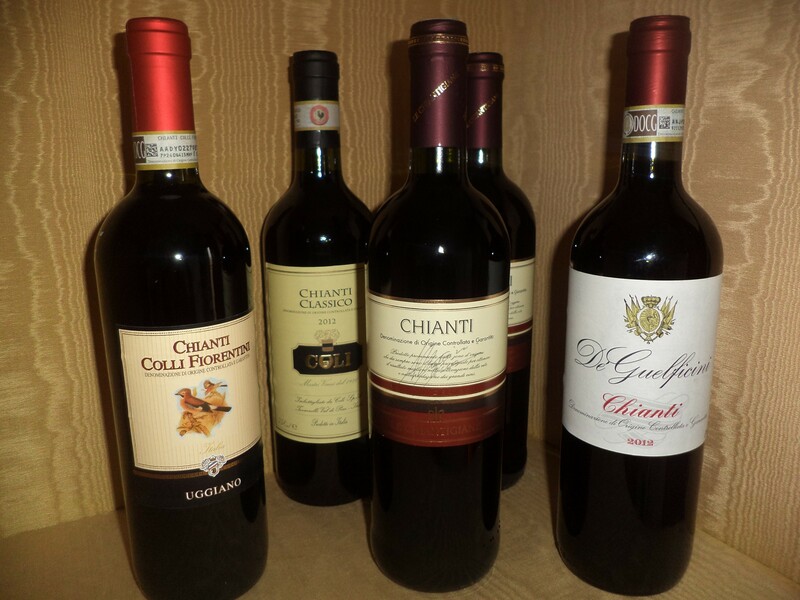 Wine that is produced in the Chianti region, is extending roughly over the two main city provinces of Florence and Siena. And certainly it is known around the world. So now it only remains to enjoy the taste of this Tuscan treasure! These are another (characteristic for Christmas) so popular in Siena pastry made with anise, almonds, candied fruits, coriander, and flour. It has an Italian origin which translates approximately to “Little Horses”. What is more traditionally is used Tuscan millefiori honey as an essential element for the biscuits. The history of Cavallucci dates back to the 16th century. Many theories are associated with the origin of its name. According to the most popular version of the story, Cavallucci was served to travelers on horseback as a source of nourishment for long trips. 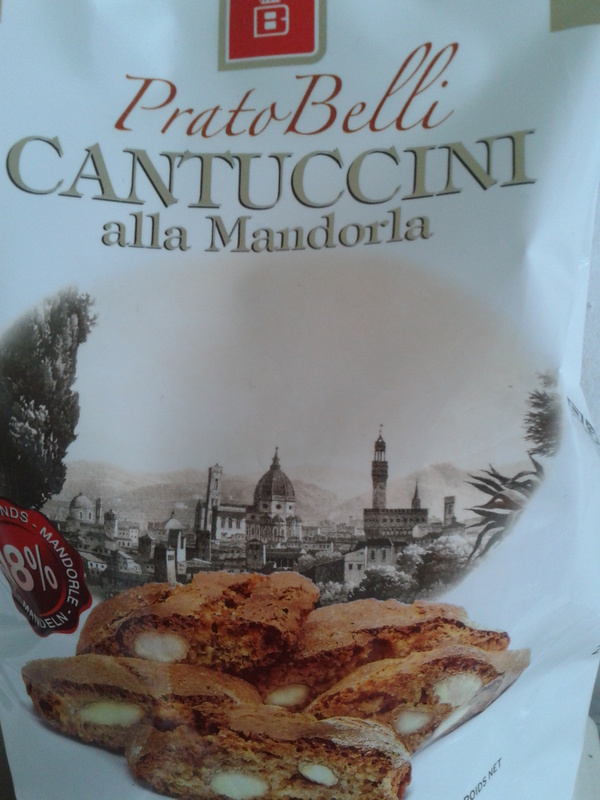 On the other hand different versions have said that these sweets were the usual snack of servants who worked in horse stables of rich Italian aristocrats, in a city which gained its fame for horse racing. Strong relationship with the horse emphasizes the fact that these cookies were originally imprinted with the image of horse. 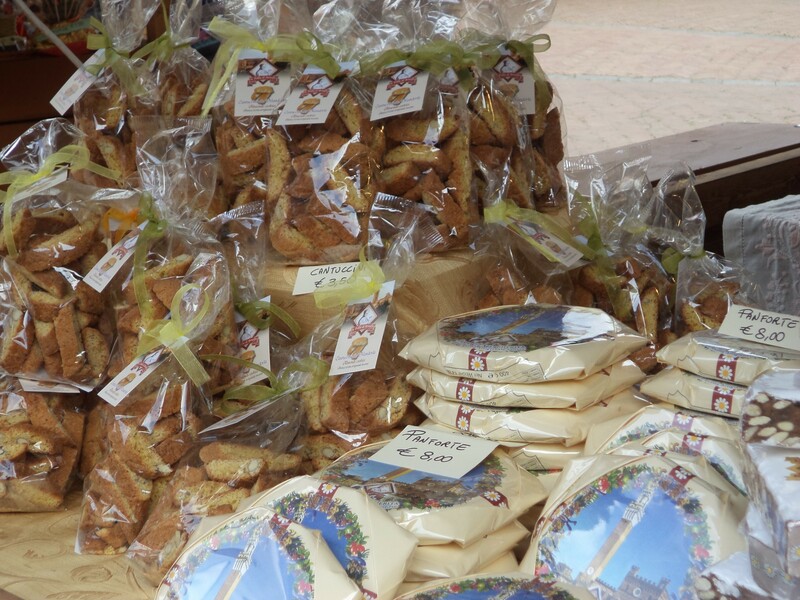 Cantuccini are twice-baked cookies originating in the Italian city of Prato. The biscuits are oblong-shaped almond biscuits, made dry and crunchy through cutting the loaf of dough while still hot and fresh from baking in the oven. And the most important is as always the recipe. Ingredients are: flour, sugar, eggs, pine nuts; and almonds that are not roasted or skinned. What is more the traditional recipe uses no form of yeast or fat. After a dough is cooked twice: once in slab form, and after cutting in sliced form, with the second baking defining how hard the biscotti are. And then is the biggest pleasure – taste. Cantuccini can be served after dessert with orange juice or with one of Tuscan wines. But also with coffee. Your choice! For me and I guess not only, travel isn’t just only sightseeing. It is also (how important) tasting the place that we visit. It is priceless to relish local, typical goodies as well as to buy and take some of them home. Isn’t it a great souvenir? So what remains? Wish you buon appetito! Especially here in Siena! This time is Kendra Thornton time (https://twitter.com/KendraThornton; http://www.thorntonpr.com/travelExpert.html) that came across my blog. In honor of Nutrition Awareness Month she was wondering if I would be interested in doing a collaboration with her about some ways to stay fit with family while on vacation. Her idea was collaborating with a very select few bloggers, on a one-on-one basis, to create a joint post where we each discuss ways to stay fit/healthy with our family while on vacation. What each of us includes in our write-ups was completely up to us. Below you have the opportunity to see the result of our collaboration. Vacations are meant for indulgences. You finally have a moment to let yourself do what you’ve wanted, and that shouldn’t stop you from eating, drinking and lounging as much as you want. However, how do you think your body will feel after a week of no fitness? When I found myself at the end of that question, I was in a lot of stomach pain and dealing with dehydration because of my choices. It’s not fun for your body when you suddenly stop exercising and bring on the saturated fats. For families or individuals traveling this spring, taking a moment to plan in fitness and healthy eating is a must. For those who love to swim, you’ll burn up to 900 calories per hour with this activity. This is a great way for teenagers and adults to enjoy an out-of-this-world experience while also getting some great fitness. It does require lessons, but some hotels actually provide scuba diving lessons as part of all-in-one vacation packages. Wherever you go this spring, you should buy a case of water to go with you or upon arrival. This will be much cheaper on your budget and saves time in the long run. It can also be helpful for maintaining a healthy diet and avoiding dehydration. Hotels across the nation have fitness centers with all kinds of weight lifting and cardio equipment. When you plan your vacation, you should make sure to include days where you go to the gym or jog down a particularly beautiful trail. There are lots of ways to work in physical fitness, but bringing your family along will certainly make it better. Hikes, walks, biking and fun runs down the beach are especially good ways to spend an afternoon on vacation. Vacations are about trying new things and having fun. One key thing to remember is that you don’t have to eat everything to enjoy the flavor. You can order something simple, change the sauce or request no cheese to make a dish healthier while maybe getting a sample platter for everyone to enjoy an indulging snack from. As Kendra wrote vacations are meant for indulgences. And unfortunately it doesn’t want to be different, especially if you spend your (so priceless) vacation in Italy. It is obvious that immediately typical Italian food and so tasty wine will catch your attention. However it doesn’t mean that you have to stop yourself. Frankly speaking it is impossible not to try tiramisu; gelato; pasta; pizza; Chianti; and typical dolce from Siena. Because where to taste it if not here! In my opinion vacation should be our carefree time, when it is not necessary to count every single calorie. That is why we should find also some time for (very important) activity. Often we don’t even realize how many ways to stay fit/healthy with our family during free days we have. Isn’t it a good idea to resign from local transport and your car to discover city by walk. You can’t imagine how much more you can see. 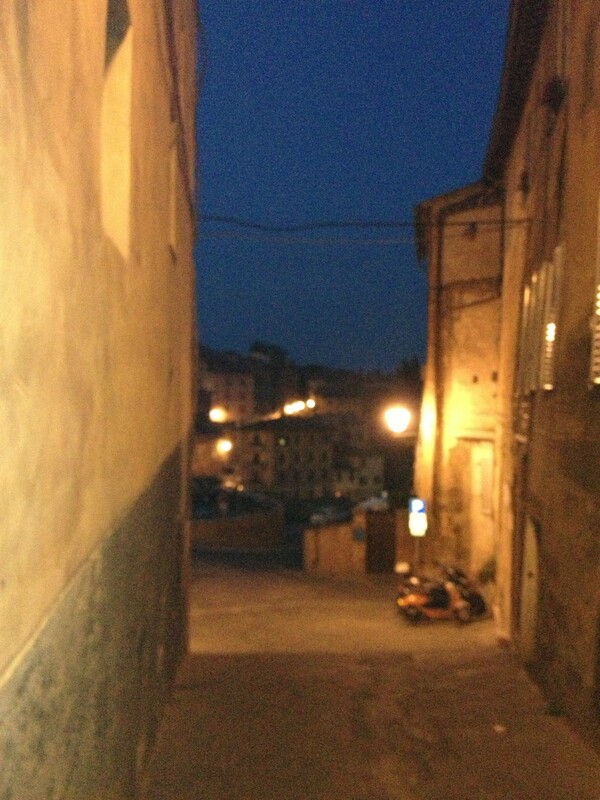 And trust me it is priceless to get lost, especially in Siena. Coming back to activity, walking is particularly easy form of exercise because it doesn’t require any special skill or special sports equipment. So let’s say, it is for everyone. It is one of the most natural forms of active recreation, which every human body accepts without doubts. This kind of activity doesn’t need to increase physical effort, because each of us can decide how far and how quickly overcome it. What is more, walking brings many benefits. It improves circulation, increases cardiac output and well-oxygenates the whole body. What is the most interesting . . . do you know that even during very fast walks release in the blood endorphins. These hormones of happiness definitely improve our mood and well-being. So you shouldn’t have any doubts that it is worth moving. Don’t forget about this, when you keep in mind your own health and of course health of your loved ones. If you have a desire to diversify your walk and to do something more Nordic walking is for you! Nordic walking is a strenuous walk with poles invented by Finnish scientists and athletes. It combines cross-country skiing techniques and brisk walking with specially designed clubs. Just only think . . . green forest, wild beach, murmuring stream, singing birds. These are a perfect setting for Nordic walking. And it depends only on you which direction you choose. Indisputable natural environment makes Nordic walking so good for our well-being during training, and even long after the workout. So it is an ideal activity for our body and spirit. Do you know that the correct Nordic Walking technique involves about 90% of the muscles!? What is more Nordic walking (using the proper technique) doesn’t require supplement other forms of physical activity, such as exercising in a gym or swimming. As you probably know Tuscany is rich in beautiful, green, and unique landscapes. This provides you priceless moments of activity with the nature in the background. So enjoy it! In Siena more and more of us decide to practice jogging. So why not to continue it during the vacation? 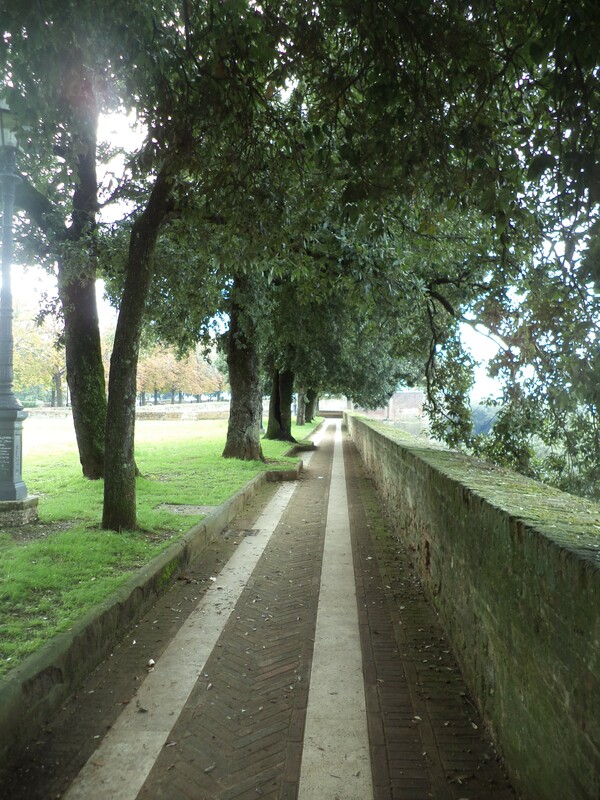 In Siena runner’s roads lead to Fortezza Medicea and what is easy to notice that jogging is for everyone regardless of gender or age. It has a salutary effect on the functioning of our body. On the benefits of jogging you can find really a lot. Here are just a few of them: running reduces the risk of obesity and the risk of serious diseases; strengthens the muscles and bones; improves mental ability and mood. What is interesting, it has a positive effect on our libido. Of course it requires of us systematic and strong will. But these depend only on us. And the last form of activity that I want to suggest you is bicycle that more or less every of us has. For me we should really use it as much as possible. But even if you don’t have it or you don’t want to take it for vocation you can easily rent bicycle in your travel destination and enjoy the beauty of nature and natural landscapes. According to experts cycling has great effects: oxygenates our body; improves the functionality of the respiratory system. And what is more it has an extremely beneficial effect on the heart. Because improves cardiovascular health, reduces the risk of coronary heart disease. By bike you can decide to go out of the city even just for a lunch break. Isn’t it much better to eat something sitting on green grass, observing beautiful nature! Forget for a while about the reality. Priceless. . .
Summarizing I guarantee you that if you decide for any activity during your vacation you will come back home invigorated with supply of energy for many, many days. Not to mention about memories that are unique souvenir of our holiday and what is more they are for all life. It remains nothing else for me like wish you happy and sunny vacation! At the end of December wrote to me Christine Maher (http://tattsi.com). 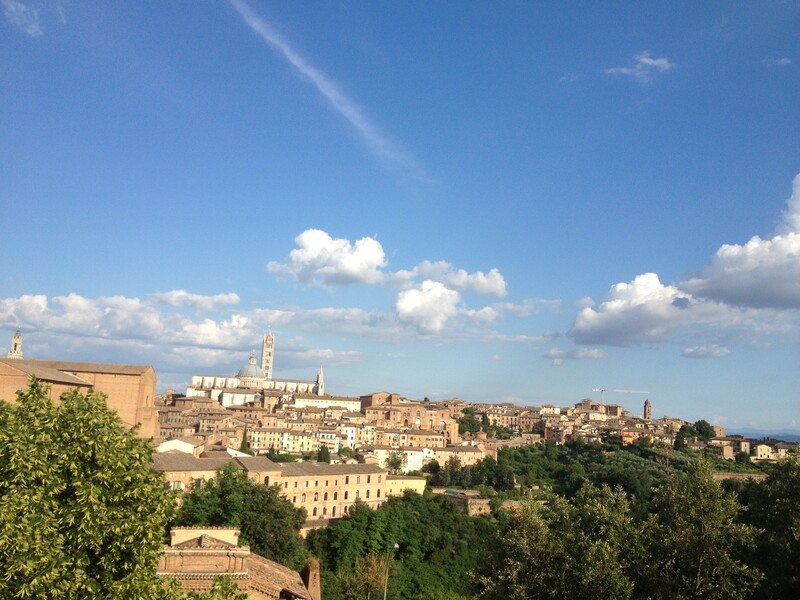 She has been last summer in Siena for 3 weeks to study Italian at Dante Alighieri. About her memories from that time she wrote on her blog. In her mail she asked me to write here (http://justvisitsiena.com/) a reviewing what it is like to travel in Tuscany (specifically in Siena) and study Italian. Couldn’t answer ”no” of course 🙂 So below I want to publish Christine Maher’s photos and text. Looking to take a trip to Italy? Have you always wanted to learn Italian? Consider going to language school. 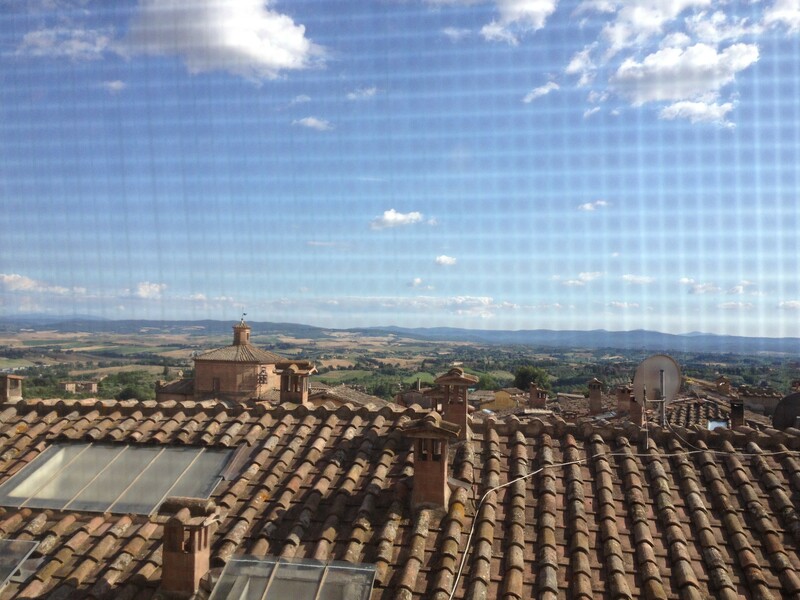 Siena is an excellent place to study. It is small enough to be walker friendly yet large enough to have all the amenities of a major metropolitan area. 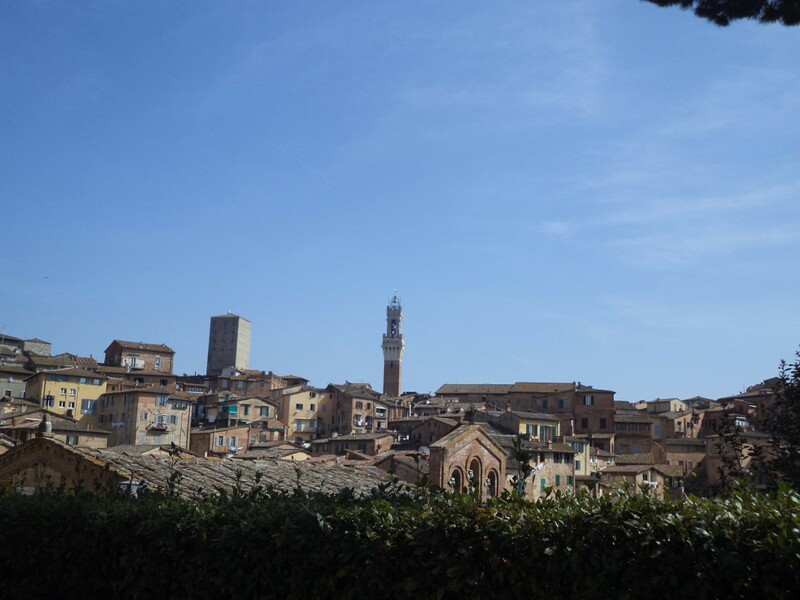 Siena offers visitors the quintessential Tuscan “la bella vita.” At the same time, it is home to many universities which makes it quite a student-friendly and contemporary town. 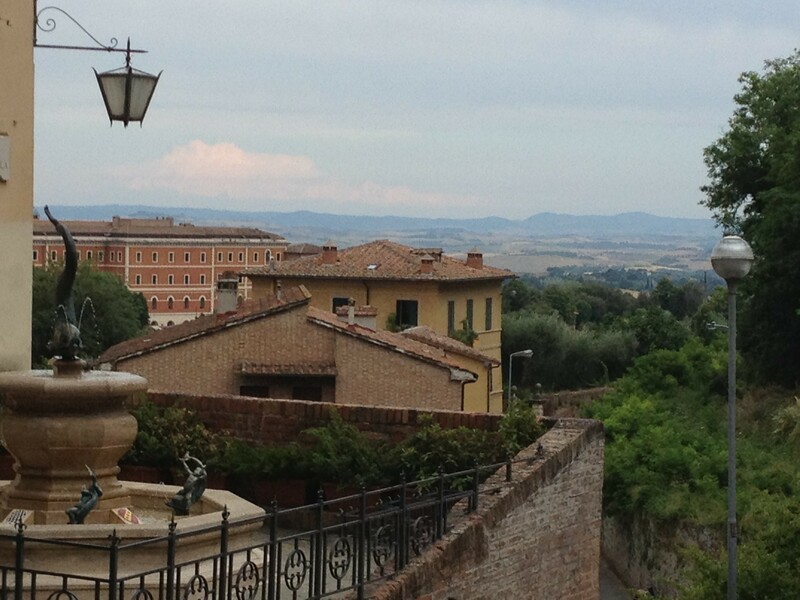 Last summer I spent 3 weeks studying intensive Italian at Siena’s Dante Alighieri School. I am an ESL (English as a Second Language) teacher in Philadelphia. I chose to go to Italy for 2 main reasons: to improve my Italian and to better understand what it is like to be a second language learner. Choosing a language school was a daunting task. Taking a long trip overseas is a big deal. It’s not someone I could afford to do every year so I wanted to make the most of it. Having more time meant I had to stretch my budget further. Doing a google search I discovered there are literally thousands of options in every city or town in Italy. Dante Alighieri received great reviews online as well as personal recommendations by my teachers at the America Italy Society in Philadelphia. 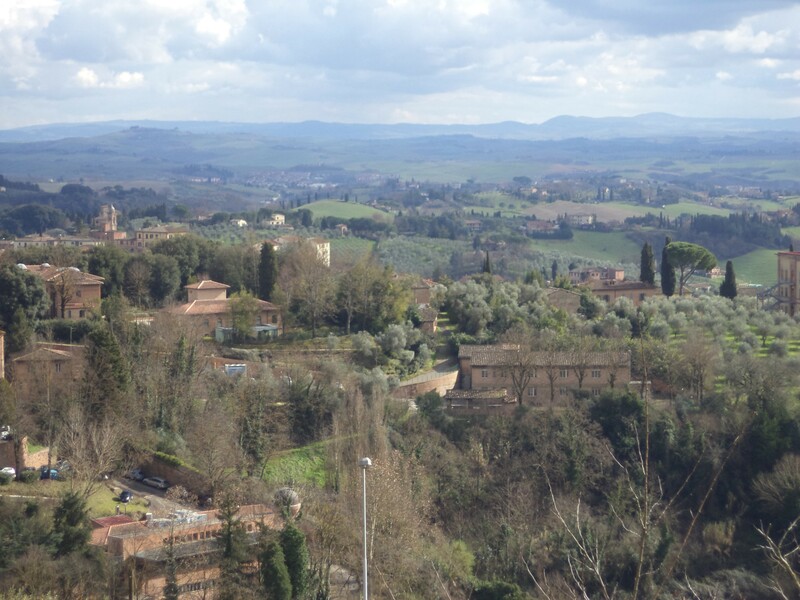 After going through the planning process and the experience, I have 5 reasons why language school in Siena, particularly Dante Alighieri could be a great travel option. The price of language schools can vary wildly. One week at Dante Alighieri starts at 165 Euros for 15 hours a week (roughly $225) but I have seen prices twice or even three times that amount at other schools. As for living arrangements, there are several options and the 2 most popular are apartments (private or shared), or a stay with a host family. I had my own private room in an apartment I shared with one other Italian university student for 20 Euros a night (about $27.00). For roughly the price of a nightly stay at a hostel I had my own bedroom, bathroom and shared kitchen. For 3 weeks of language school plus 3 weeks in an apartment I spent 960 Euros (I took the 20 hour a week intensive courses so they were 180 Euros). (about $1,300). A 10 day tour to Europe is normally anywhere from 2,200 to 3,000. I spent the same amount of money for 3 weeks of classes, my flight and the apartment. Just like a group tour, studying at a language school gives you a built in circle of friends. People who go to language school come from many different continents, a wide variety of age groups, and have different reasons for learning Italian. Some are there just because they love the language. Others are there because their company sent them for work purposes. Whatever the reason, everyone shares a love of the culture and language. In language school your mornings are occupied by classes and if you want to get the most out of your time studying, you have to spend time doing homework. If you love Italian the time flies because the classes are enjoyable. Homework can be completed in a bar drinking your favorite espresso beverage or at the school lounge. Spend your afternoons and evenings exploring museums, watching movies under the stars, or having drinks or dinner with your classmates. 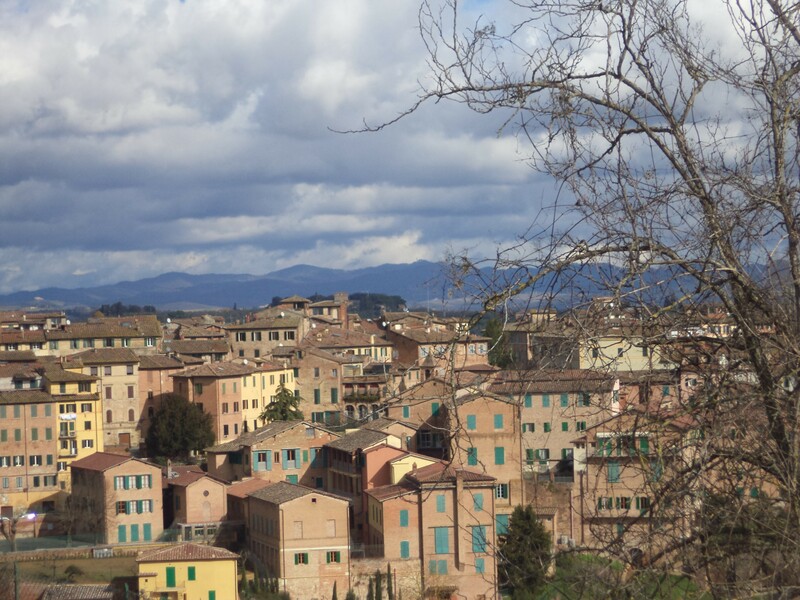 On the weekends there are plenty of places to visit via bus or train like Rome, Florence, Perugia, Assisi or Pisa, and countless hill towns within a few hours. If you want to opt out of crowded cities there are busses to the beach or vineyards for wine tasting. You get to live like a local in an apartment or a home stay which means you get to really experience living in a place (not just visiting). At Dante Alighieri, the teachers encourage you to practice your Italian by telling the locals, “Non sono una turista, sono una studentessa.” (I am not a tourist, I am a student). Siena is full of tourists and the locals are used to speaking English to cater to an American crowd (or as several admitted, because they enjoy practicing English.) The thing is, going to language school allows you to be more than a tourist. You are a resident looking for an authentic experience who can converse with the locals. Give it just a week and the bar tender will know how you like your coffee, the pizza guy will enjoy your daily chats about foreign politics, and you will be asked directions by tourists in Italian. You can shop for local food, cook your own meals and save money by not having to eat out. Your Italian will improve rapidly because you will be getting the balance of structured class instruction with the freedom to use your Italian in a natural environment. 5) Dante Alighieri is a great school! Since I am a second language teacher, I know about what makes a language class work. At Dante Alighieri the teachers take a very interactive approach. They are great at explaining new concepts while allowing the students many opportunities to read, write, listen and speak. The teachers are professional, encouraging, and always well-prepared. The lessons are fun and there is plenty of variety. The school sponsors plenty of extra events outside of class like wine tastings, movies and lectures. They are free or low cost. The building is beautiful and centrally located with colorful, clean rooms and just a 5 minute walk from the Piazza Il Campo. As always there are possible Drawbacks. 1) You certainly can come to Dante Alighieri (or any language school) with no prior experience in the language you are studying. This is probably not the best use of your time however, unless you can spend at least 6 weeks there. That way you will really feel like you have made progress and reach a new level. If you would like to study a language in another country and you only have a couple of weeks, you should probably have a basic knowledge of the language before you arrive. If you are excited by the idea of studying Italian in Italy, you will probably enjoy language school. If you want to stay in an ideal city that is not too large yet has plenty of opportunities for culture and cuisine, Siena is a great place. Scuola Dante Alighieri will provide you a wonderful learning experience.